I've been working to add some more information into my Factfulness Scheme of Work. I've been going through a few earlier resources of mine, to re-use some of the ideas, and shape them towards the Factfulness project. It was an early effort at a collaborative effort, which hasn't really paid off so far, with few additions being made, but was an interesting idea of its time. The scheme of work is available on the GA website for GA members. 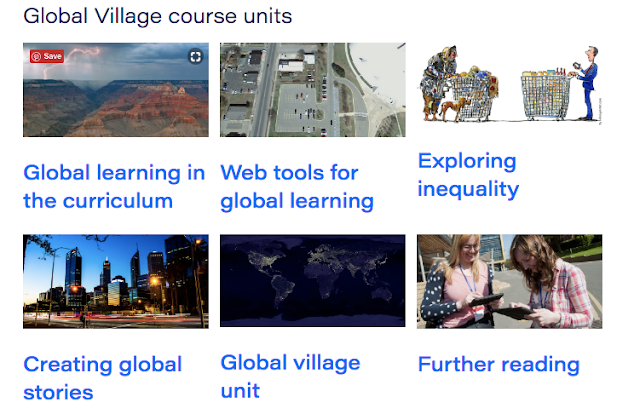 This online course introduces a proposed new scheme of work for KS3 geography, which makes use of web tools to explore our ‘Global Village’. Technology can allow access to a range of topical and contemporary material, which can then be used alongside existing publications and other resources to construct a number of stories. These pages draw on the importance of the ISM (initial stimulus material) that Margaret Roberts refers to in ‘Geography through Enquiry’, and this online course provides a number of options for developing appropriate hooks, followed by the opportunities to investigate the issues in more depth. One important element of this course is the creation of more nuanced arguments when considering notions of development and global inequality. The work of Hans Rosling and others has started to inform the debate on whether terms such as ‘first world’ and ‘third world’, even ‘developed’ and ‘developing’ are appropriate anymore. There is also the notion of Aid and charity and the importance of avoiding stereotyping and a particular view on the relationship that the UK and other EU countries might have with former colonial territories. There are five sections to the course, plus a page of associated resources and links. You may wish to browse the pages in numerical order, but each of them is self-contained and provides guidance and ideas for the creation of global learning materials around the idea of our ‘Global Village’ where all students and teachers live. There are also activities which are designed primarily for teachers rather than students, and intended to act as pointers for thinking, or for discussions within department meetings. Some could also be used as prompts for conversations with students, perhaps in sessions where curriculum change or lesson content is negotiated.